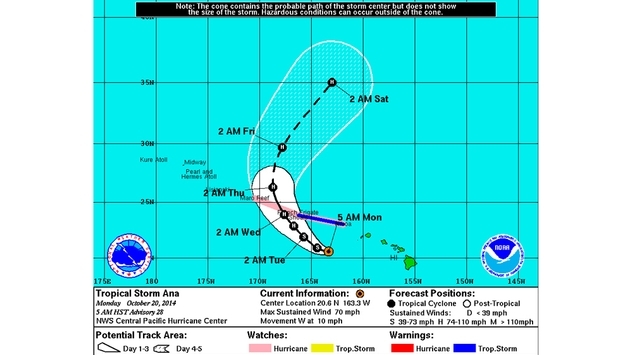 The National Weather Service has downgraded Ana to a Tropical Storm. Kauai County remains under a Tropical Storm Warning and a Flash Flood Watch. The City & County of Honolulu remains under a flash flood warning, as the storm continues to move west past the Hawaiian Islands. Heavy rainfall and high surf is expected across the state through Monday. Visitors and residents should continue to exercise caution and heed all warnings by state and county officials. The HTA has safety tips available on their Travel Smart Hawaii website in English, Japanese, Korean and Chinese. An updated list of flight cancellations as well as closures of statewide parks, attractions and activities can also be found on the HTA website. This will be the final update from the HTA regarding Tropical Storm Ana, pending further developments.